In this digital world, buyers are using the web to shop online. The National Association of Realtors (NAR) has said that Realtors® are also focusing on the web to market their listing. 91% of Realtors are using social media to some extent in their business. NAR also states that 51% of buyers found their home online. Photography plays a big role in promoting property listings online. Hiring a professional photographer to take these pictures can go a long way in getting viewings from potential buyers. In 2018, most real estate agents are using some type of photography to promote their listings online. We've even seen a rise in video walkthroughs were, from the comfort of their home, the buyer can be guided through the house and have a better understanding of the floorplan, the feel and the lighting. The use of 3D imaging is also on the rise and is used often to showcase high-end properties and builders model homes. More often than none, real estate agents tend to cheap out and use their phone to take pictures of their rentals listings. This is where I differentiate myself from other agents. In order to attract the most amount of inquiries and tenants on the web, it is crucial to showcase the rental unit in the best way possible. Having professional pictures taken of the unit can go a long way in attracting quality tenants. The best part is that these pictures can be reused when there is a change in tenancy. Selling a home with pictures is great. Selling a home without pictures can be tricky for many reasons. If no pictures are visible online buyers may assume that the seller has something to hide or that the house is not that nice inside and is not worthy of being shown. Although the above statements can be true there could be a few other reasons for an MLS listing not to have pictures on the web. We often come across listings that are occupied by tenants. In the case where the owner did not obtain permission from the tenant to take pictures inside or in a situation where he doesn't have pictures from when the unit was empty, it can be hard to showcase the home on the web. Buyers may skip over the property assuming that there's something wrong and that the visit is not worth their time. Having pictures on the web can eliminate potential buyers that may have a different taste in style or type of property but it does bring in quality inquiries from buyers who already know what to expect when they visit the home. This has the potential of eliminating those who wouldn't of like the home in the first place if they would of only been shown pictures in the first place. People remember pictures more than they remember words. I've seen people vividly remember pictures they saw online and could sometimes point out the difference in paint shade colour from the online picture and the physical one. They may also point out that the room looked better or different in the pictures. These mean that the pictures had a lasting impression on the buyer or tenant and may have been the reason why they inquired. Often buyers have not completely read the description and they've already made their mind that they want to visit the home. 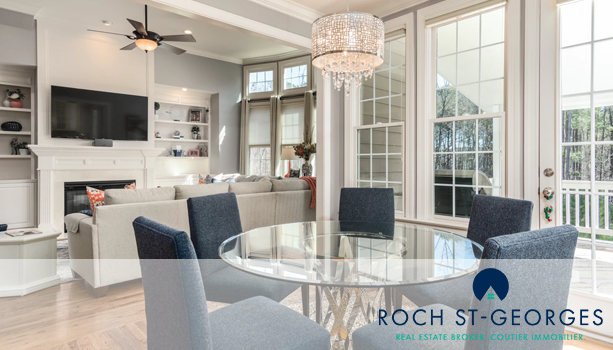 If you are looking to sell your Ottawa home or condo in the coming months call 613-889-7732 to discuss your real estate needs with Roch St-Georges, real estate broker in Ottawa, ON. Here is some great camera gear if you are into taking real estate photography. My business is mostly based on word of mouth where past buyers and sellers refer me to their friends and family who are in the market for a new home or condo or are looking for my marketing expertise for the sale of their property in Ottawa. 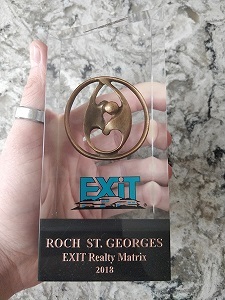 I received the 2018 Bronze Award for having done 25+ deals in 2018. The video below is from an improvised Award Ceremony that was posted on Facebook Live. A big thank you to my clients who have trusted me with their real estate needs and for all of those who continue to recommend me to their family, friends and business colleagues. If you are in the market to buy real estate in Ottawa we should talk. Call me at 613-889-7732 to discuss your real estate needs.